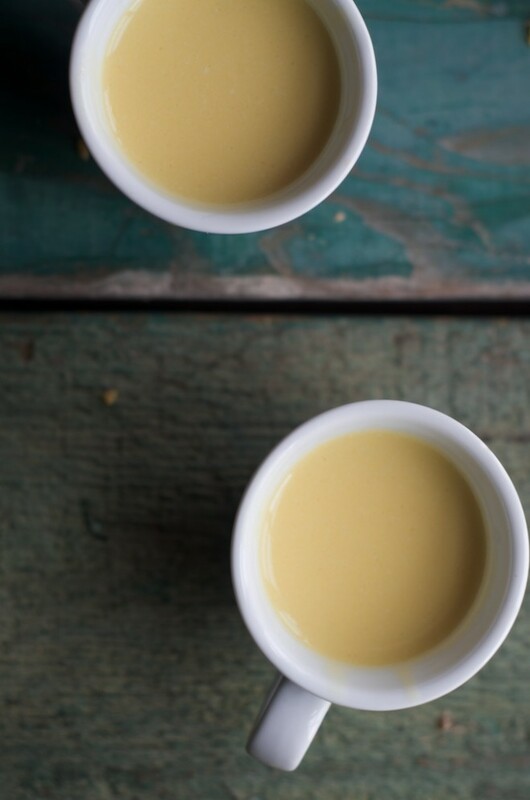 This winter, we discovered Golden Milk or Turmeric Tea, and fell in love with its astringent, but smooth and bright flavor. I often make it now instead of the hot chocolates, molasses milks and herbal chai my family loves. When I can get it, I like to use fresh turmeric in my cooking. I love its faint metallic, astringent flavor and the bright yellow-orange it gives my pilafs and curries. In wintertime, when access to raw milk becomes scarce, I tend to use coconut milk and coconut water in this recipe; however, if you have good access to fresh milk, be sure to use it as it’s delightful with both cow’s milk and coconut milk. Turmeric and ginger are rhizomes, and while they look like roots, they’re actually the subterraneous stems of tropical plants. Both turmeric and ginger have long been lauded for their medicinal as well as culinary properties, and often season the traditional foods of south Asian kitchens. When you peel away the papery skin that envelops the turmeric rhizome, it reveals a brilliant orange color. This orange pigment colors the foods in which it is cooked, and gives Golden Milk its characteristic yellow-gold color. It is also this pigment, as well as other components found in turmeric, that contribute to its strong antioxidant capacity. While turmeric has long-been used in traditional south Asian folk medicine, only recently have researchers begun looking into its effects on various cancers, cardiovascular disease and Alzheimer’s disease and diabetes. Curcumin, a component of turmeric, is strongly anti-inflammatory. Ginger, like turmeric, offers strong antioxidant capacity and has similarly enjoyed a long history of use in folk medicine where it is traditionally used to easy stomach upset or to ease the discomfort caused by flus and colds. Preliminary research also links ginger to slowed tumor growth and to the inhibition of the growth of cancerous ovarian cells, though ginger’s affect on cancer is poorly understood and warrants more research. While it’s relatively easy to find fresh ginger in any grocery store, health food store or supermarket, finding fresh turmeric is a little more challenging. I typically find fresh turmeric in health food stores only seasonally – in winter. I typically purchase powdered turmeric online (available here – where I purchase most of my organic spices). When I prepare my Golden Milk, I begin first by combining freshly grated ginger and turmeric with grass-fed ghee to form a fine paste. Long used in Ayurvedic cooking, ghee is a type of clarified butter. Ghee prepared from the butter of grass-fed cows is extraordinarily rich in fat-soluble vitamins A and K2; it is also a good source of conjugated linoleic acid, a healthy fat with anticarcinogenic properties. Turmeric and ginger, both rich in antioxidants, also work synergistically together with ghee, as ghee, and other healthy fats, enable those fat-soluble nutrients to be better absorbed. You can purchase grass-fed ghee in many health food stores, as well as online (see sources). Lastly, I use raw Manuka honey as a sweetener. Manuka honey is a single varietal honey from New Zealand with a thick texture and a strong, almost medicinal flavor. It is rich in antioxidants and has strong antimicrobial properties. Due to demand and relatively limited supply, Manuka honey is expensive, and any raw honey can be substituted for it in this recipe with little change in flavor. I typically purchase our Manuka honey online from reputable sources, and I use it only sparingly. 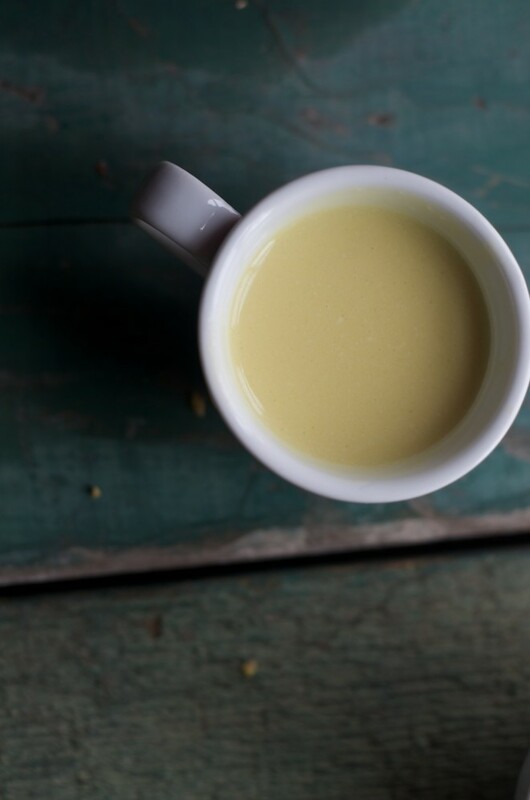 Creamy, faintly sweet and fragrant with the potent flavors of ginger and turmeric, Golden Milk is a deeply nourishing drink, warming and perfect for winter afternoons. 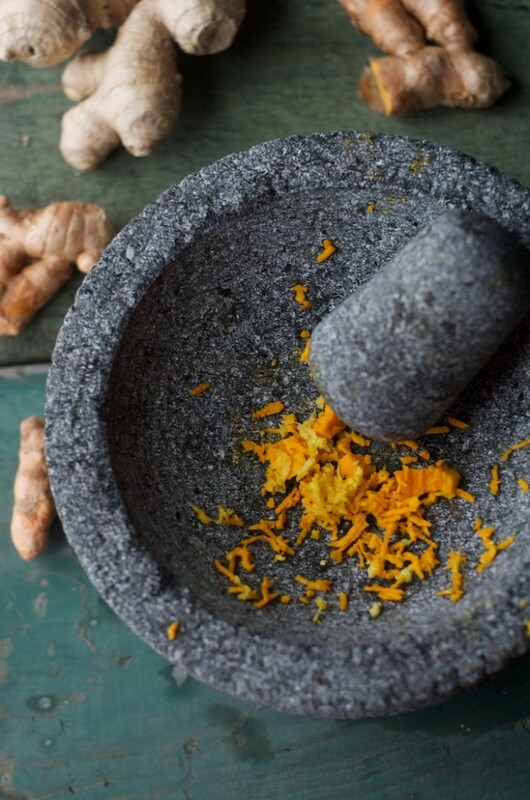 Peel both the turmeric and ginger, then grate them finely into a mortar or a molcajete (I use this one.) 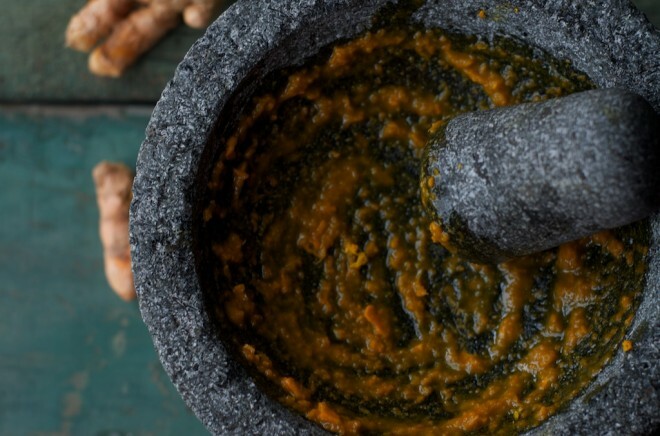 Spoon the ghee into the mortar or molcajete, and grind the ghee into the turmeric and ginger with your pestle until they form a fine paste. Pour the coconut milk and coconut water into a saucepan, and spoon in the paste made with turmeric, ginger and ghee. Turn the heat up to medium-high and warm the ingredients together until little bubbles just begin to creep up the sides of the pot. Turn off the heat and cover the saucepan, allowing the turmeric and ginger to steep about 3 minutes. Strain the golden milk through a fine-mesh strainer or tea strainer into a tea pot. Stir in the Manuka honey and continue stirring until it dissolves. Serve warm. Golden Milk is traditionally made with cow's milk. If you wish to omit the coconut milk and coconut water, simply substitute 2 cups whole milk. If you cannot find fresh turmeric, substitute 2 teaspoons organic powdered turmeric (available here). This looks lovely! If one didn’t have access to turmeric root, would it be best to skip the recipe rather than substituting turmeric powder? No, I would definitely try it with powdered turmeric. I should adjust the recipe to make note of that. I would use 2 teaspoons powdered turmeric instead of fresh. Thank you so much for the adjustment! I am excited to try it! Gosh, that looks delicious! We really struggle finding raw turmeric, it really is such a wonder. We will have to try this as soon as we can find some. You can alsi try an Asian market. Thats where i get mine from. I’ve really been wanting to try tumeric tea for awhile, and this is another reminder to make that happen! This not only looks yummy, but it is just filled with great things for the immune system. I can’t wait to try it! I just saw turmeric at my health food store, so now that people have mentioned it can be difficult to find, I’m going to pick some up next time (even if it is $12.99 a pound!). Jenny, do you have any suggestions on how to store turmeric root long term? I want to continue taking it for its immune boosting properties all year round. If you can find organic turmeric whole, you can plant it. I will be planting some as houseplants to start. Ginger can also.be planted as a houseplant. Google the directions. If you live in an area that has ethnic food stores, fresh turmeric can be found in Indian markets for very reasonable prices. If you aren’t near one, friends who lives near a city may be able get you some and ship it to you for much cheaper than $12.99/lb! Our local Meijers carries it for $3.99/lb. I’ve heard that fresh turmeric root freezes well. Ginger and turmeric freeze well. I scrub the roots with a brush, slice thinly, and freeze in a ziplock baggie. Just be sure to lay the bag flat so that the slices are spread out. You can take what you need easily. That is a good price. We pay. 17.00 – 19.00 lb. Could i use coconut oil instead of ghee? I just did in mine (and with cow’s milk instead of the coconut milk + coconut water combo), and it turned out wonderfully. Until very recently I’ve only ever had turmeric in its dried, powder form on eggs, rice and veggies. I recently found some at a well stocked grocery and have been putting it in our gazpacho’s and carrot-apple-ginger juice. Thank you for this great, informative post! Pinned for future reference! Can I substitute ginger powder? That is all i have right now. Also I dont like the flavor of ghee cN i leave it out or just use raw butter? Really does look lovely – great lighting in these photos too! Thanks much for publishing this recipe. This is my go-to recipe when the kids are down with the flu or fever. I usually add a dash of pepper too. I am from India and this recipe is usually handed over generations. My kids growing up in US usually don’t take kindly to traditional Indian recipes, but after I showed them your post, they seem to be more approving! One can usually find fresh turmeric in Indian grocery stores. It’s easy to grow too. Just sow a fresh piece of turmeric and after a couple of months, you can pull out the grass to find several bulbs of turmeric. Yes I can’t have any milk or milk products so no ghee, what would you suggest? Also honey does me in….coconut nectar perhaps? First off, you’re photography is gorgeous. Second, I keep hearing so many good things about turmeric so I feel like I’m going to have incorporating some more of it in my life. I’m 18 and I never get sick but I actually think the contribution to that is the fact that I eat a ton of garlic. usually, at least in Canada, we have fresh turmeric in Indian stores. Thank you Jenny! I have been making fresh ginger root tea to combat seasonal allergies and now I have this great recipe from you to give it a Power Boost! I have to agree with Joshua, your photography is wonderful!!! I am a food blogger and I must add your blog is one of my favorites! Since I make my own coconut milk and it is not as concentrated as the canned, I think I’ll just use that in place of the coconut milk and coconut water in the recipe. Can you give me your thoughts regarding the best alternatives to raw milk. I gather that you would say coconut milk. We currently have access to raw milk but that could change. Also, what I would see as the next best alternative–low vat past. nonhomo. milk is sold very far from us. I am wondering how I could best feed my family of 4 children under these circumstances. I would love to hear your thoughts. THanks! I’ve seen fresh turmeric at Azure Standard and didn’t know what to do with it. Thanks for the recipe. I’ll buy some turmeric now and give it a try! Can you please post me the recipe for this golden tea? Debbie – It’s posted above the comments section. I have raw goat’s milk and would prefer to use it over coconut milk. What is the correct amount of raw milk to use in this recipe? I understand the need to add the water to the coconut milk due to its thicker state. Thanks. Oh gee, I just read the final line above – sorry! Two cups of raw goat milk it is! We loved this beautiful, warming drink! I made it first for my daughter using coconut milk and coconut water. She didn’t have ghee so I simply used a knob of butter. It turned out really rich and creamy and delicious. Just now I made some for my husband using organic cow milk and ghee. I followed the recipe the same and the mixture coagulated in the saucepan for some reason! I salvaged it with my stick blender but the chalky paste ended up in the bottom of our mugs. We used a spoon to finish it off. I wonder why the milk separated like that? I won’t stop making this wonderful drink but will likely use coconut milk next time. Just made this w a few changes and its amazing! Thanks…think I will add some cinnamon next time too…..
Is this safe for pregnant women to consume? It doesn’t contain a “medicinal” dose of turmeric, so a cup now and then is all right, yes? It’s a cold and rainy day today and I am heading to the kitchen to make this! Tumeric has also been proven to have great anti-fungal qualities, I just read a study out of India. Sounds wonderful – I love Mountain Rose as well; terrific customer service! I have the same question as Allison Garcia above; can coconut oil be used in place of ghee? If not, what can? I can’t wait to try this- so different and perfect for the season! Just tried this after bringing the toddler home sick from daycare. It was very yummy and comforting. It also made me want to cut of some carrots, snow peas and chicken and make a soup out of it. I think that would be wonderful, too. I tried this with coconut oil, cow’s milk and powdered turmeric. It was a vivid yellow and tasted wonderful! Lovely recipe, thank you. I have read that the benefits of turmeric are enhanced through the use of black pepper. The black pepper helps the body absorb the turmeric. That is why you see a lot of cultural recipes that use turmeric also use pepper. So maybe a pinch of black pepper could be added. it was such a nice suding worm drin. I found some white tumeric at my grocery store, do you know if that will be as beneficial as the yellow variety? I’m going to have to try this. Fresh turmeric is often for sale at the local Indian food store here in L.A. I’m also intrigued about trying to pot it. Hi, thanks for the delicious recipes. I see that the recipe calls for straining out the ginger and tumeric, could I leave the grated pieces in the cup and drink it? Just wondering if it would be to powerful on the stomach? You inspired me with this post that I hunted all around for turmeric root. I am always trying to find recipes to throw turmeric root into. Thanks! Correct me if I’m wrong, but I think in Ayurvedic medicine, honey should never be heated past 104 degrees F.. Yes, but I don’t buy into that. Ive heard of turmeric tea also but the way I get alot of this great food into me is to use it in large amounts in my broth and then put 1 tsp in my cups of broth, daily, along with 1/2 tbsp dulse. Two birds with one stone! AND no fuss or muss as even the turmeric tea has you make a paste also. RAW turmeric IS *great*, but for ppl without access to it, the powdered is good too. The only difference for me is, instead of the ginger, I use cinnamon as it’s a diabetes preventative, and it does make a lovely tea mixed with the turmeric and, occasionally, a sprinkling of liquorice root. No matter what recipe you use though, as long as you’re drinking a turmeric tea, you should notice a huge difference in your health as it’s just about a ‘miracle spice’. Made this today for the first time, after finding fresh turmeric in a natural food store (finally!). Although it’s no longer winter, I find this tea very comforting, somewhat similar to how I feel about my morning coffee. Very, very nice. Thank you. My husband has been releived of his terrible heartburn by a ginger and fruit infused drink I have been making for him. I am goung to try making this next time. Looks great! In the United States I noticed you can now buy through amazon! Seriously fresh tumeric root on amazon but alas in canada a bit trickier 🙁 I found organic fresh at a local health food store although in Toronto it’s more easily found and much cheaper at Asian stores lol I’m going to try and grow some ! I was excited to read about golden milk from other posts and was ready to try when one of my sisters sent me info on turmeric. Unfortunately I take plavix and because turmeric can cause excessive bleeding you should not be combining the both of them together. I have been grating equal parts fresh turmeric and ginger in the food processor. put in a saucepan and add coconut oil, coconut or almond milk and a few crushed black peppercorns. I bring this to a boil and shut off, add honey and let it sit un strained til cool. I heat up 8 oz every night for my arthritic knee. I think it might be helping! they say 40 days straight to get a beneficial result. I never strain it but chew,chew, chew at the end of each cup. I figure- the extra fiber and what might be left in the roots can only be helpful! Golden milk is a wonderful cuppa to have as a nightcap. I’ve made it with organic almond milk but coconut milk is very OK with me! I don’t know why you couldn’t make it with coconut oil also. This is one of these splendid and simple Ayurvedic recipes that soothe and nourish…but be sure you do NOT heat the honey. Adding it to the hot tea is OK but only after it’s off the burner. Ayurvedic cooking is very specific that cooking with honey is definitely not advised as it doesn’t digest well and clogs the subtle channels. I would use coconut sugar also or succanat, organic of course. Great idea, but it might be better to use spring water or coconut water or nut milk beverage, and then add 1-2 tbsp. of a fat, coconut milk, olive oil, almond oil, etc. One cup of full fat coconut milk is LOADED w/ fat, mostly saturated fat. Um, where did my comment go? To the author…my suggestion was to use coconut water or regular spring water when boiling the turmeric and ginger, then after straining, add 1-2 tbsp. of coconut milk, like as a creamer. You would probably lose weight, and it would be better for people’s health b/c they would not be consuming all that saturated fat that is in 1 c. of full fat coconut milk. I made this with fresh tumeric, fresh ginger, and cow’s milk. I gently warmed up the milk with the paste, let it steep…and got cheese. The curds separated out from the whey. Not a yummy drink. Has anyone else had it work with cow’s milk? This just happened to me as well. Did you end up finding out why it curdled? This just happened to me! The milk was only just beginning to warm up on medium heat, had made the paste with turmeric and ginger and ghee which was in the milk and BAM! curdles. Like TOTALLY seperates into whey and solids. Happened to a friend of mine while making this too. I’ve made this successfully before but with butter in place of ghee and didn’t curdle. Any insight as to why this happens? So I made it again, and it curdled again, and I discovered it was not the mix of coconut water with whole milk, but the milk coming to a boil. So watch it carefully… if it gets too hot, it curdles. Why raw honey if it’s going to be cooked? I’ve read in several places that turmeric is assimilated better if used in conjunction with black pepper. Have you heard that? Even after being super cautious my milk unfortunately curdled. Having used up all my fresh high quality ingredients I could not try again. Thankfully I was able to carefully whip it together in my vitamix & then just strained out the bits to save it. Will definitely try again some day, still baffled at what went wrong….. It sounds like you may have used dairy rather than coconut milk. That’s a heavyweight concoction!!! Has all of my, what I call my “Big Boys”!!! And how often would you recommend we drink this? Like a daily drink? In the evening? Do suggest. I recommend enjoying it as often as you please, as it suits you. Food is nourishing, but it is not a prescription. WOW! I just made this at home in London in the UK. Fortunately fresh turmeric is very easy to get here. I was about to use powdered then by chance saw fresh in my fridge! ANYWAY… WOW. WOW. WOW. What a healing, nourishing treat! I don’t have ghee, so I used raw grass fed butter instead. Also I had a fresh virgin coconut so I used the raw coconut water, and the raw white flesh to make the milk!! :o) PERFECTION! ps didn’t need any sweetness as the raw coconut was sweet enough. The SO was feeling poorly due to a cold, so i made this with high fat jersey cows milk, and put it in the Vitamix. It was absolutely delicious. Got it warm in the VItamix too! I will definitely make it again, possibly adding chai spice mix and with fresh young coconut milk. Didn’t have the Manuka honey – that would have been great – but was able to find fresh turmeric at my local Sprouts market (No. California) a pint clamshell box was $4.99 and there’s enough turmeric in there for an army! gonna be making it a lot more this week! Is there a time of day that is preferable to drink this? Does it have any affect on sleeping? Hi, While turmeric and black pepper can work synergistically together, turmeric doesn’t need black pepper in order to be effective. Pray tell: What is the Sikh way? Quick I must make this , no ghee in hand!what subs would you suggest. Thanks in advance.